1. If you want to use the video resource, arrange for video access. 2. Set up class observation charts based on the examples below using a Chalkboard, white board, or Smartboard®. 4. 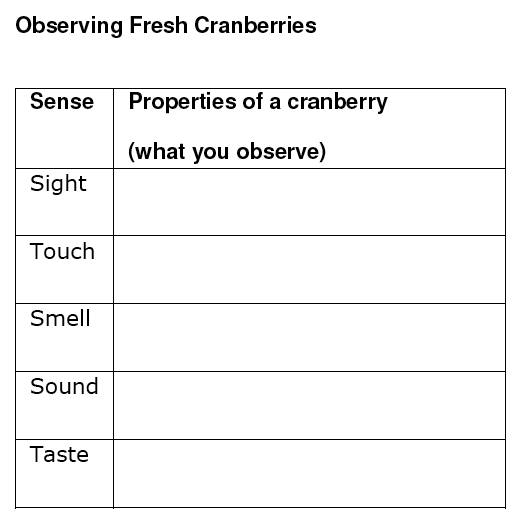 Set up a Cranberry Questions Chart, in a location that can be posted for the duration of your cranberry studies. 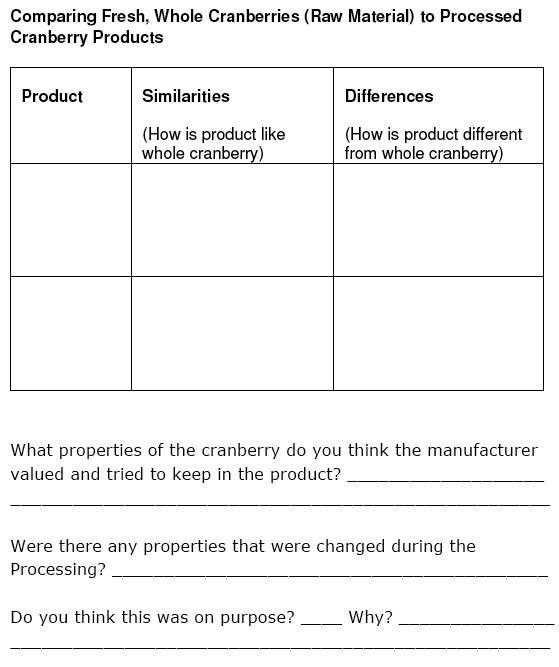 Label this sheet, Cranberry Questions; you will begin to collect questions during this lesson, and return to them throughout the curriculum. 5. Wash approximately 1 cup of cranberries (enough so that each student may taste 1-2) for tasting. Set them aside. Plan to use the remainder for the sensory explorations. 6. If you do not have access to fresh, whole cranberries, it is important to substitute the videos for the personal experience with the cranberries. However, this alone is nowhere near as powerful as experiencing the whole cranberries on their own, or in conjunction with the videos. 7. Prepare two medium sized samples (4 oz. 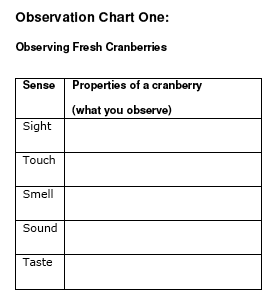 or so) of cranberry products for each lab group of 3-4 students. Provide each group with a combination of sample products, altering combination of products.